Wouldn’t it be nice if your kingdom extended beyond the walls of your home? You’re in luck. ; it can, with a traveling sprinkler. You’ll never go back to using a standard sprinkler system again once you’ve used one of Big Sprinkler’s innovative designs. A traveling sprinkler from Big Sprinkler is exactly what its name implies and is the perfect choice to use anywhere portable, unattended irrigation is needed. 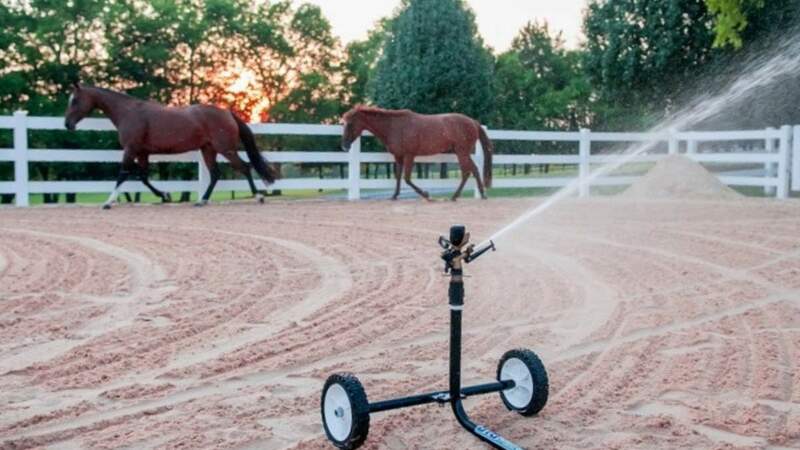 Traveling sprinklers eliminate the need to lug hoses across the yard. The stationary base unit houses a turbine drive system which is powered by the water that flows through it into the sprinkler head, eliminating the need for electricity. 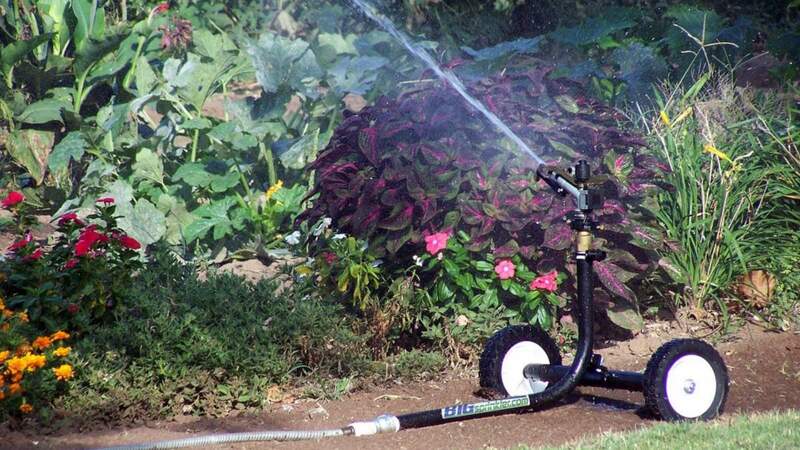 Attach your garden hose to the stationary base, pull a lever to release the turbine drive system, and stretch out the hose and sprinkler to the desired length. Then, walk back to the stationary base and move the lever to re-engage the turbine drive system. Finally, set the automatic shut-off valve, start your water, and the traveling sprinkler will do the rest. It’s important to note, to use a traveling sprinkler you must have an inlet pressure of 30-60 PSI. If your inlet pressure is outside this range – keeping friction loss in mind – this may not be the best sprinkler option for you. However, it is possible to boost your pressure with an electric booster pump while keeping your flow rate the same. Why Should I Choose a Traveling Sprinkler? 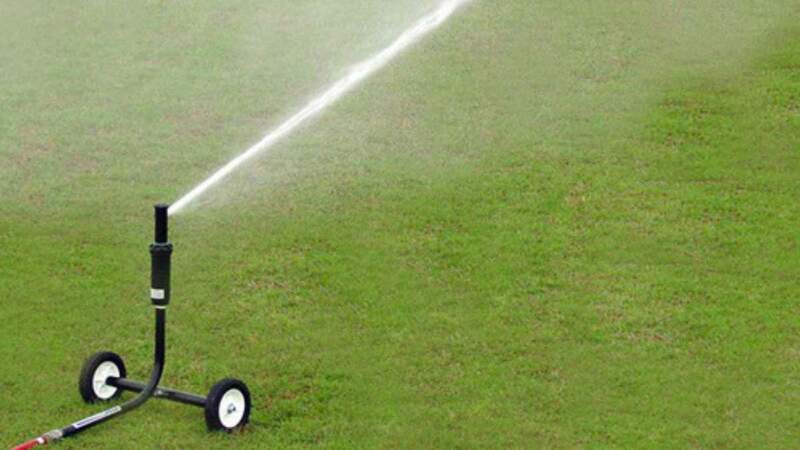 Big Sprinkler offers you two traveling sprinklers from which to choose. The RG25 Traveling Sprinkler is the larger of the two options and has proven itself durable throughout the past 15 years. It operates with 3 to 12 gallons per minute when you select one of the three included nozzles. You must have an inlet pressure between 35 and 60 PSI for the RG25 to operate properly. You can choose to adapt your RG25 with a high-speed gear option for dust control in livestock arenas. This allows a smaller amount of water to be dropped quickly, killing the dust without soaking the arena floor and creating mud. The latest innovation from Big Sprinkler is the smaller RG20 Traveling Sprinkler. It uses the same turbine drive system as the RG25 but is more compact. As a smaller unit, the RG20 can operate between 30 and 60 PSI with 3 to 8 gallons per minute, depending on the nozzle selection. 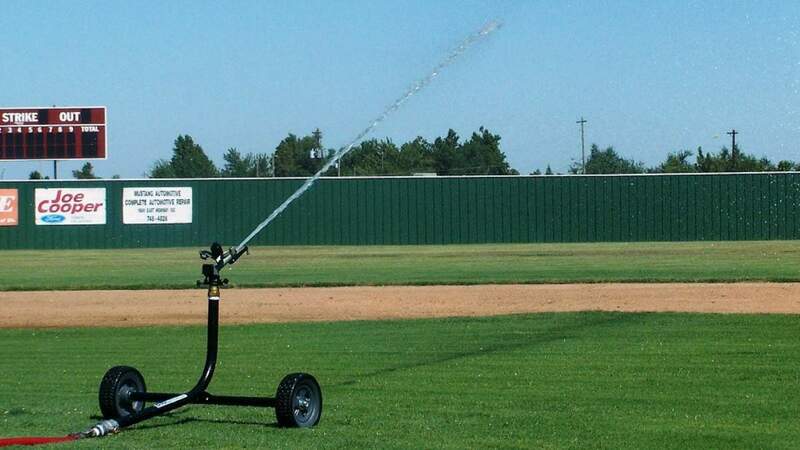 These field-proven traveling sprinklers are manufactured with steel construction, a greaseable stainless steel water inlet, a brass shut off valve, and a Rainbird sprinkler head, allowing for years of reliable service. Both the RG25 and RG20 employ a standard garden hose connector for reaching the water source so that you won’t need special equipment. Not only are these sprinklers ideal for your lawn, but they are an excellent choice for your garden or small farm. Since the base is on wheels, you can move it wherever and whenever you need water. 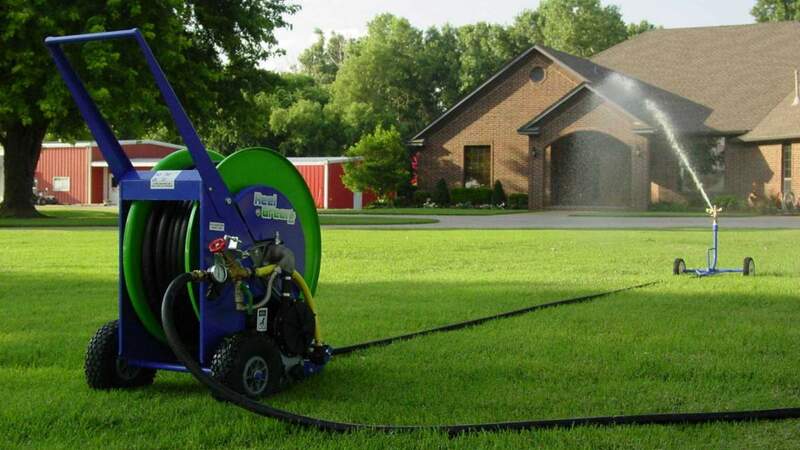 Even folks who are easily exhausted by lawn care chores use traveling sprinklers with ease. How Much Ground Does a Traveling Sprinkler Cover? There are several variables involved when calculating how much water is spread and how far it will go when using a traveling sprinkler. What is your inlet water pressure? How much pressure are you losing due to friction loss? Are there hills or valleys in your yard? You plan to use the RG25 Traveling Sprinkler in your flower garden. You set it up with the smallest nozzle – the 4 mm option – since the pressure and gallons per minute are on the lower end of the scale at 35 PSI and 3.2 GPM respectively. You unspool the 165 feet of hose and place your sprinkler where you want it to start. The area you will water before the sprinkler shuts itself off will be up to 72 feet wide and 201 feet long. To add about one-quarter-inch of water to the flower garden will take between seven and eight hours. A Traveling Sprinkler could change the way you spend your time outside. Instead of moving hoses and sprinkler heads, you could be admiring your lush, green grass and colorful flowers. Find out more by contacting us today. 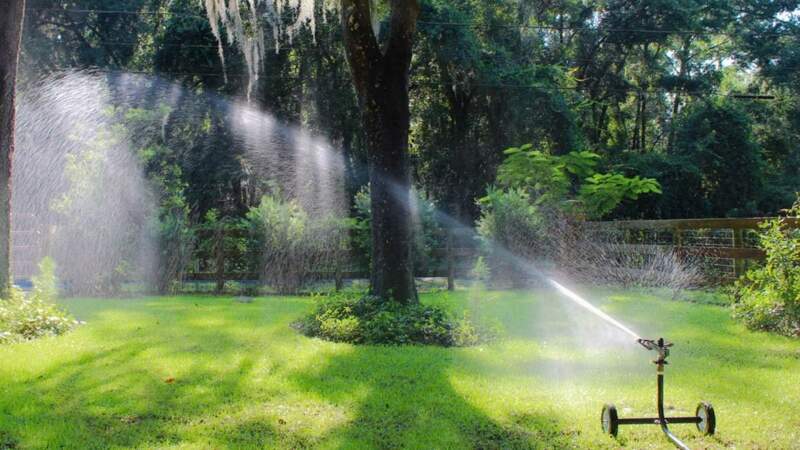 We’re here to help you find exactly the right solution for your irrigation needs.